Last month’s post, I shared with you all how I”ve felt guilty about measuring my children’s development based on their physical growth. I’ve shrugged off the idea in my head and now I’m more focus on developing not just their cognitive skills but as well as their emotional growth. At the start of this school year, Mr. JG & I felt a bit pressured when it came to Juro’s ability to read. He’s now in Grade 1 but he’s one of the youngest in his batch. We felt the pressure since most of his classmates already know how to read at this level. Most of them spent their summers in reading lab while Juro took it easy and enjoyed summer at the beach or elsewhere heehee. Like I said before I’m not the type who would bombard my kids with activities or added academic sessions over summer. Anyhow, during the first quarter PTC I met up with his English teacher who assured me that this year is all about making progress. She told me that with her guidance and our follow through at home, Juro will be able to read on his own by the end of the school year. I’m pretty sure a lot of you are familiar with the hashtag I’ve been using the past few months on my social media feed and here on the blog #NurtureTheGift . But how can one do so? Based on my own experience patience, effort & guidance for me are the key things you need to help your child nurture his/her gifts. Four months into persistently challenging Juro to read three to four letter words and he’s finally doing it! I know it may not be much of a big deal but seeing progress develop right before my eyes is just something I find amazing! Sharing with you all some of the things I’ve observed during the months we’ve been trying to read. I admit some days I find myself hurrying this little boy to read already. Yikes! I know, I know. I’ve learned to really be more patient when it comes to teaching him how to read. You will need lots of this so that you child can feel comfortable doing his thing at his own pace. And once he is, he’ll find learning more fun and intuitive. Sometimes it’s easier to just leave it all up to the school to worry about our child’s academics. After all that’s what they’re there for right? Well true but more often than not, following through at home is what makes the difference. The teachers of our kids can only do so much in guiding them academically. 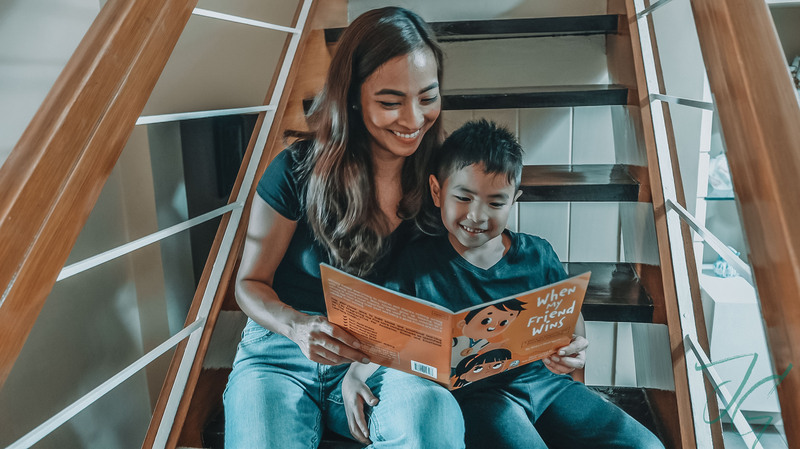 Incorporating the emotional aspect & cultivating parent-child relationship is just as important as having patience when it comes to nurturing our children. Showing effort that you are there for your child when he needs is most is one of the things you need to have. Whether you’re a stay-at-home mom or a working mom, set 5 or 10 minutes of your time each night to focus on your child. Doing this everyday is a good way to show you’re 100% committed in your child’s development. Patience and effort put together is the guidance in itself. Providing opportunity and devoting time to your child is an integral part in helping him realise that no matter how challenging a task is, he can do it because you’re there to support him all the way. The first few weeks of trying to read was a struggle not just for Juro but also for me and Mr. JG. There were times that we’d just call it a day and let him figure it out on his own at school. But this method just backfired at us because in the end it’s our guidance that he needed the most. So glad we snapped out of it and just learned along with him. All the times we sat down with him the past few months has finally paid off because he now enjoys reading as much as his sister does. Hooray for progress! If you’ve seen this photo on my Instagram, you’ve probably watched how he slowly read this book. Even I was surprised he was able to read disappointed without second guessing nor pausing. If there’s one thing I’m still learning it is to be patient not just towards my kids but towards myself as well. After all, I’m not just here trying to help them nurture their gifts, I’m also here trying to be a better parent. To any parent who is struggle to strive for perfection, relax mom/dad the goal is to have progress, don’t beat yourself up if it’s not perfect. Keep going because you’re doing great!